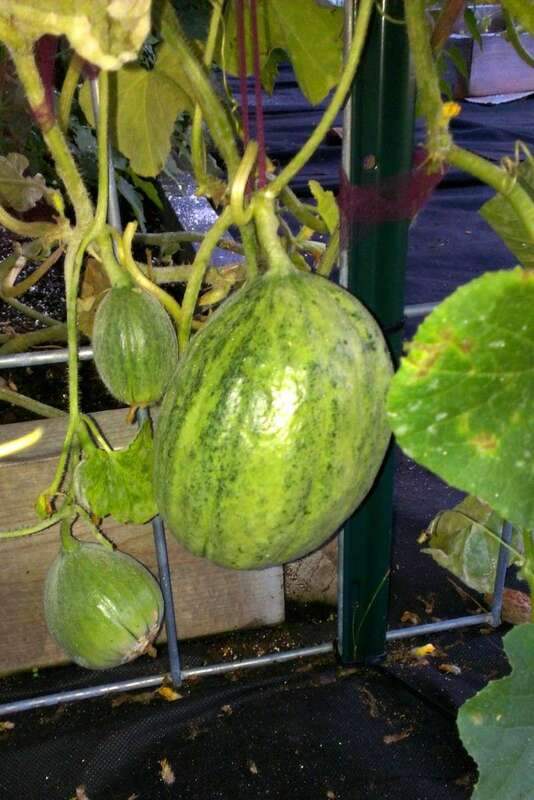 I've tried for 2 seasons to grow various types of cucumbers, squash, and melons. I have yet to find an effective method to combat powdery mildew. I'm in the Santa Clara area. I've tried a pressure sprayer with baking soda & water. And various other methods. Suggestions? I haven't tried it yet but I will be trying this, come late summer because that's when it usually shows up in my yard. 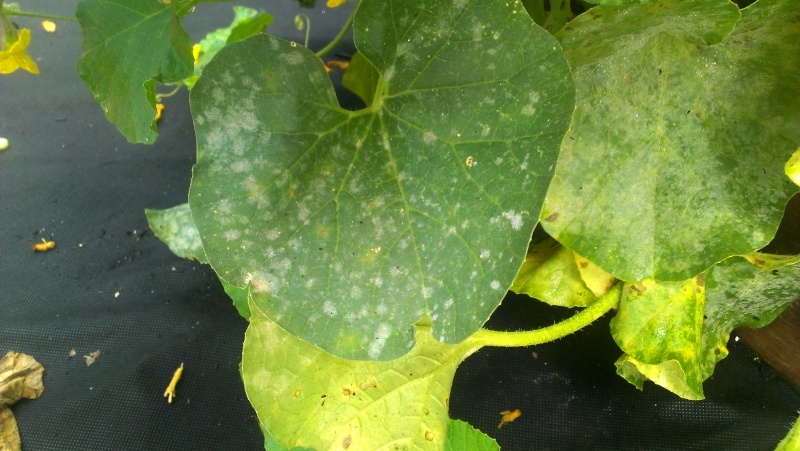 Powdery mildew requires a management strategy. It is more of a process vs. an event in taking care to keep it suppressed. I've been using Green Cure fungicide for the last two years -- it works! It's very similar to the baking soda idea, but it also includes a surficant so it sticks to the leaves better. I use one those gallon hand-held pressure sprayers. Only mix a half gallon, which is enough for my SFG. I bought an 8oz container from Amazon.com. More links to information about PM. Arla I think your leaves look normal with regard to powdery mildew, but I am not an expert. Look at the photos on this website. It does look like near the edges you have leaf miner problems. Do you see the fine white squiggly line in the leaves? A little orange worm type thingy is crawling around in there. Those areas will go dead. 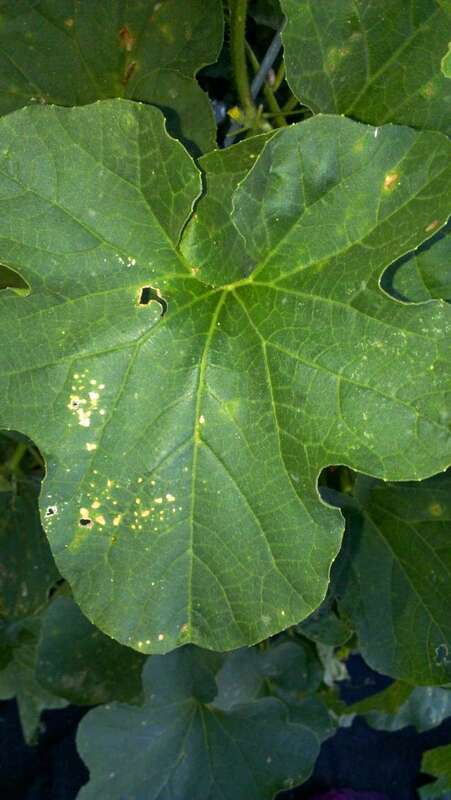 If I am correct about the leaf miner problem. I read that you can squish the leaf miner (which some say you can see the orange through the leaf in the sunshine or feel for it) in the leaf and people also use Neem Oil. I have never had leaf miners and I have never used Neem Oil so maybe someone else can help with that. The Neem Oil disrupts their life cycle and I would think the squishing would also, since you kill it. @pattipan wrote: I've been using Green Cure fungicide for the last two years -- it works! Thanks Pattipan, I just ordered some. The PM is going crazy here in the last few days! Yea, PM went berserk this last week. This weekend I saw a leaf or two with some spots, so I cut them off and disposed of them. Yesterday, literally like four days later, 90% of the plant leaves are covered. Similar to this image on the web. Going out with a spray bottle and spraying every leaf is incredibly time consuming. Although I imagine a baking soda/water combination isn't harmful to my toddler I could enlist his 'help' although 80% of it will probably end up on him. I can barely discuss this topic I'm so disgusted. I did well in the beginning spraying the leaves and keeping it at bay, but once the drizzle started coming almost every day I gave up. But, that being said, I found PM resistant varieties in the Johnny seeds catalog and logged them on my order form. Has anyone had success with PM resistant veggies? I used about 25-30% milk to 75% water and it did the trick. It made my leaves look really nice and shiny. I didn't think it would work so I bought Green Cure earlier in the day, before I started using milk solution. After using the milk, I tried the Green Cure. I actually like the milk solution better just because it made my leaves look so nice and green. Next I'm going to combine them to see what happens. Someone else, a few days ago, said they used a 50% solution of milk to water and they were pleased with the outcome. I don't think it matters, but both of us used 2% fat milk. @grownsunshine wrote: I used about 25-30% milk to 75% water and it did the trick. It made my leaves look really nice and shiny. I didn't think it would work so I bought Green Cure earlier in the day, before I started using milk solution. I'm using the Green Cure, and the PM keeps coming back. Are you finding the PM comes back with the milk? It takes a long time to get the fronts and backs of all those leaves!! Thanks for any info! PM is really dependent upon the weather... you can slow it down but you cannot stop it. So sad. Glad I saw this thread because some of the ladies who have plots by mine in the community garden have PM and I couldn't remember how to help fix it. Thanks!! 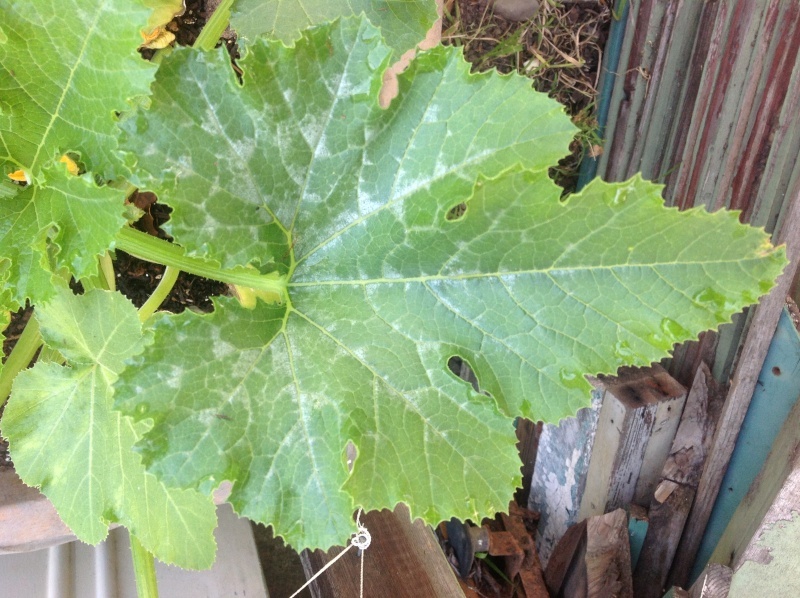 I have also got powdery mildew on my cantaloupe plant. I sprayed with a baking soda solution, 1 tbs baking soda, 1 tsp dissolved Ivory soap to 1 gal of water. They looked much better the next day, but still had some spots. Applied a 2nd treatment. Today they look even better, but some of the leaves were dried up, so I pruned all the bad ones. I was treating nearby potato plants for spider beetles with DE, so sprinkled some on a few leaves to see if it helps PM. I had 19 cantaloupes on this plant before this happened. Sure hope I don't loose too many. My largest one appears to have some pm on it. Will it hurt the cantaloupe? Here is one of the leaves that had PM, and this is after the baking soda treatment. Just a few spots of damage. Southern Gardener - I use a gallon sprayer from Walmart $9. I used to use a hand pump water sprayer, but it's too much work, even tho my forearms were starting to look like Popeyes . With the gallon sprayer it just takes a minute - mix the solution, pump and spray. http://www.walmart.com/ip/RL-Flo-Master-1-Gallon-Sprayer/13376324 I was doing regular/daily treatments of milk/water until I couldn't see the mold anymore. Now I'm using GC periodically. It seems to be stronger and gives my leaves a flatter color look. I also prune old leaves that are struggling, as Unit649 does. I want the nutrients to flow to my healthier leaves and to the fruit to keep them strong, rather than trying to revive struggling leaves. Yes, the PM periodically comes back. I think if the weather is right, it will always come back. In the fall, when the weather changes, I plan on spraying my plants with worm casting tea as Josh does. Apparently spraying the plants with tea promotes healthier plants that are better able to fend off diseases. Hope it doesn't exacerbate the molding. He didn't seem to have any problems with PM, then again he's a child/gardener from another plant...worm tea, another use for my sprayer. mschaef - don't you love it when this forum discusses info about a topic you just happen to be looking for?! Actually Southern, our humidity in coastal/semi-coastal SoCal goes really high overnight when the temps plunge. During the day, we're 80/90s and 30% humidity, but over night as the temp drops to the mid-low 60s, the relatively humidity goes rocketing to 90% which is ideal breeding grounds for PM. After losing my curbits to PM for the last two years, this year I was able to stop the assault and since have held it at bay with a mixture of 2 oz 3% hyrdogen peroxide added to a gallon of water. I use a hand sprayer and liberally coat the ground, stems and leaves. I spray from the ground to the top, then from top to bottom after every rain and on alternate days when it is dry. For all of you that use milk against PM. I just had a member ask if it is okay to use milk that has spoiled. What do you think? I'm using milk instead of Neem because of the bees. Milk is doing a good job. I'm really surprised! @sanderson wrote: For all of you that use milk against PM. Thanks for posting my question Sanderson. I doubt it would do any harm as long as it's not chunky and clogging the spray. I just wonder if it'll still be effective.